Cured salmon (gravad lax) was part of every big festivity in my family, like Christmas, Easter and Midsummer (which we celebrate in a big way in Sweden). But my mother didn’t stop there – I more or less grew up on it. And that might explain why it took me a while before I started making it myself. I still don’t make it very often but every time I do, I cannot get over how much I do love the taste and the texture of it. When I found a Gordon Ramsay recipe with a totally different way of curing, I fell in love with cured salmon all over again. Does it beat the Swedish way of curing? Nah, it’s so different there is no comparison between the two. But like my mother, I would eat either of them at any time of the year even though Ramsay uses very wintry spices in this recipe. Some Swedish people only cure the salmon for 24 hours but as far as my mother and I are concerned (and many more with us), it requires a curing period of 48 hours. The Ramsay recipe has a 24 hour curing time but I find that you can easily extend that with another 6 - 10 hours to get more flavour (it is very mild with only 24 hours curing). No one in my family would cure their Swedish-style salmon (gravad lax) without a bit of alcohol, but you do not have to use it. My mother preferred to use either gin or cognac. Even though I’m not a whiskey drinker, I prefer to cure my Swedish-style salmon with a bit of whiskey. 1. Place the two salmon sides, skin-side down, on a plate. Mix together the sugar, salt and white pepper and divide the mixture between the two salmon pieces, rubbing it into the salmon flesh with your hands. 2. Place all the chopped dill on top of one of the salmon pieces, and then the other salmon piece, now with the flesh-side down, on top of that and push it down a bit. Place the salmon, with one piece on top of the other, in a thick plastic bag. Add the whiskey to the bag, squeeze out as much air as possible and tie a knot on the bag as close as possible to the salmon. 3. Place the bag on a plate in the fridge, turning it over 3-4 times during 48 hours. Once it is ready, take the salmon out of the bag and using kitchen towel, thoroughly brush off all of the the salt, sugar, pepper and dill mixture. 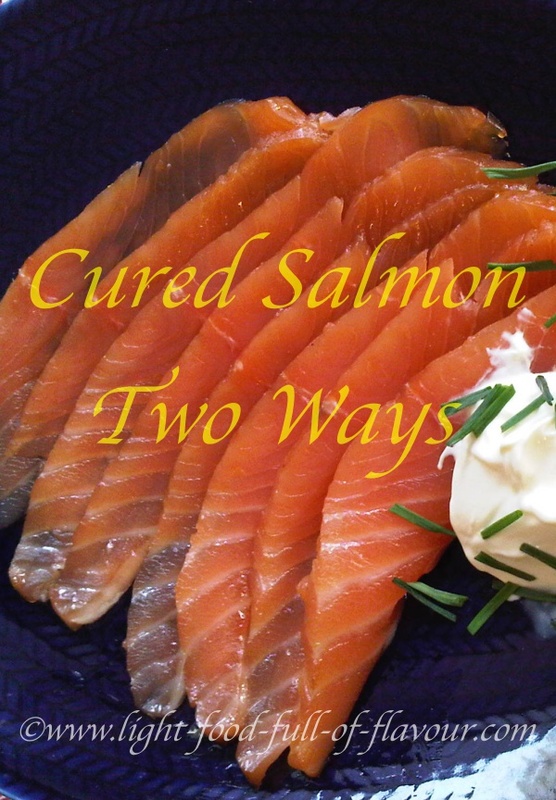 The cured salmon will easily keep for 6-7 days if well covered and kept in the fridge. You can also freeze it for up to 2 months. I prefer to cut quite thin slices of the salmon. I like to eat it as a light lunch with poached eggs, toasted sourdough bread, a salad consisting of baby spinach leaves, tomatoes and avocado and, very importantly, a dill and mustard sauce (see below). Or I eat the salmon with scrambled eggs for a luxurious breakfast. In Sweden it is often served on a rye bread of the pumpernickel type with some dill and mustard sauce. Whisk together the mustard, sugar and vinegar with a good pinch of salt and some pepper. Keep whisking while very slowly adding the oil - the sauce will split if you add the oil too quickly - until the sauce emulsifies and thickens. Once you have incorporated all the oil, stir in the chopped dill. 1. Whizz the sugar, salt, orange zest, star anise and cinnamon stick in a food processor. Tip over the salmon, cover with cling film and leave in the fridge for at least 24 hours. 2. Wash any remaining mixture off the salmon and leave to dry for 1 hour. Slice when needed. This salmon is absolutely delicious on toasted sourdough bread with a bit of crème fraiche and some chopped chives.